The primary function of an air barrier is to prevent or restrict air leakage through a building’s envelope. Air barriers are intended to control air flow from the exterior to the interior of a building, as well as from the interior to the exterior of a building. Be strong enough to support the stresses applied to it. An air barrier is not a single product or material. Rather, it is a combination of materials assembled and joined together as a system to provide a continuous barrier to air leakage through the building envelope. An air barrier’s effectiveness can be greatly reduced by openings and penetrations, even small ones. These openings can be caused by poor design, poor workmanship, and damage from other trades, improper sealing and flashing, mechanical forces, aging, and other forms of degradation. When discussing air barriers, roofing membranes, and the building envelope, another important topic comes to mind: vapor retarders. There is often confusion between air barriers and vapors retarders. The purpose of a vapor retarder is to minimize or reduce water vapor diffusion into a low-slope roof or wall system. In other words, it is used to prevent the formation of condensation in a low-slope roof or wall system. Generally speaking, a vapor retarder is used where a building’s interior humidity conditions are expected to be relatively high, and the building is located in a cold climate. A vapor retarder is commonly installed on the warm (interior) side of a roof or wall. In a low-slope roof assembly, the vapor retarder is normally installed under the primary roof insulation. Therefore, one will often see it installed directly on a roof deck (such as a concrete or wood deck) or on a continuous substrate (such as gypsum board or wood panels) that is installed directly over a metal deck. C402.5.1.2.1 Materials. Materials with an air permeability not greater than 0.004 cfm/ft2 (0.02 L/s · m2) under a pressure differential of 0.3” water gauge (75 Pa) when tested in accordance with ASTM E 2178 shall comply with this section. Materials in Items 1 through 16 shall be deemed to comply with this section, provided joints are sealed and materials are installed as air barriers in accordance with the manufacturer’s instructions. Plywood with a thickness of not less than 3/8” (10 mm). Oriented strand board having a thickness of not less than 3/8” (10 mm). Extruded polystyrene insulation board having a thickness of not less than ½” (12 mm). Foil-back polyisocyanurate insulation board having a thickness of not less than ½” (12 mm). Closed-cell spray foam at a minimum density of 1.5 pcf (2.4 kg/m3) having a thickness of not less than 1½” (38 mm). Open-cell spray foam with a density between 0.4 and 1.5 pcf (0.6 and 2.4 kg/m3) and having a thickness of not less than 4.5” (113 mm). Exterior or interior gypsum board having a thickness of not less than ½” (12 mm). Cement board having a thickness of not less than ½” (12 mm). A Portland cement/sand parge, or gypsum plaster having a thickness of not less than 5/8” (16 mm). For new construction, it is the responsibility of the building’s design professional to: determine the need for an air barrier; provide details on sealing joints, penetrations, transition areas, etc. ; and verify an air barrier’s compatibility with other materials. 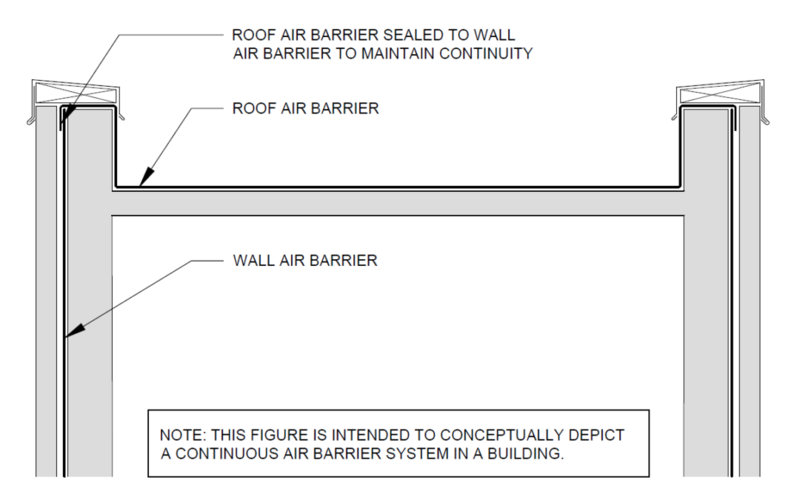 Also, bear in mind, the opportune time to address air barriers is in the design and pre-construction phases of a project. In other words, the time to discuss air barriers is before construction begins, not during construction.